When the first Homo Sapien picked up a ball he probably did so because he was bored with the primitive sport of hunting. If he were resurrected from his grave, he would be surprised to find out how much sport has changed over the years. Modern hunting wouldn't really please primitive citizens of this planet like Captain Cavemen because he would need to obtain a valid license to hunt unless he decides to come to countries where poaching is 'permitted'. Modern sport is more about rules, money and media than about its primary objectives of providing leisure and physical exercise. And if Darwin ever wanted to calculate the speed at which sports have evolved over the last few decades, he would have probably gone bonkers. Yes, it's the bat and ball game, which has changed the most over the years. After all how many other sports have so many formats all running concurrently? Cricket initially started as a game that would seemingly go on for unlimited amounts of time, played by players dressed in white clothing. When people were tired of watching cricket matches that would run for five days without delivering a conclusive verdict about which team was better, limited overs cricket was born. By this time detergents were probably adept at removing stains from coloured clothing, so cricket could be played by players wearing coloured kits with a white ball not even good enough to last for 50 overs. And because cricket still did not fit into the life of its audience like football, 20 overs a side contests were conceived. And that's only the three formats recognised and played internationally, three day cricket, 40-overs cricket, Hong Kong Cricket Sixes or beach cricket are not really uncommon. As if tinkering with the format was not enough, cricket administrators suddenly decided cricket needed to borrow ideas from football and thus the 'supersub' was born. Now any batsman who couldn't score at an accelerated rate could be substituted by a more opportune hard hitter. Tiebreakers were conceived to deliver the verdict when the spectators had already watched 40 overs of inconclusive cricket. So how do you copy penalty shootouts in football? Just throw the ball and try to shatters the stumps! But before anyone really noticed, these additions to cricket were aborted and the game was given a more 'cricketish' tiebreaker in the form of a Super Over. Spicing up cricket was not totally accomplished by just shortening the game to 20 overs and Power Plays and Free Hits came in to ensure bowlers got thumped all over the ground while the batsmen continue to pile up runs at an almost astronomical rate. Hawk-eye, UDRS and Snicko stepped in to ensure we understood the blunders, made by the two nearly inanimate men in the middle, better, but nevertheless they still keep making mistakes and we keep accepting them as human error at the expense of our favourite team. Finally cricket needed to become the money-spinner that football and Bollywood (which is not a sport) already were. Jerseys became living billboards and sixes turned into DLF Maximums. Bollywood gatecrashed into cricket and suddenly rich women who couldn't differentiate between pace and spin bowling were the owners of cricket teams! And the question is if cricket is a gentleman's game, what is a gentleman supposed to look at: the ball or cavorting cheerleaders in skimpy clothing? If your dad watched Pele play, ask him the name of Pele's girlfriend and you are bound to be disappointed. He probably doesn't know if Pele even had a girlfriend after all. But you already know the WAGs of your favourite players. That's how football has changed over the years and nowadays having a good-looking girlfriend is almost a requirement that every star has to fulfil. Unlike ICC, FIFA is not an organisation that enjoys fiddling with the rules of the game but even then some changes were on the cards. The Golden Goal rule chalked out to punish goalkeeping gaffes or defending blunders in extra time barely lasted a decade, while severe castigation of callousness inside the penalty box led to a marriage between histrionics and football. 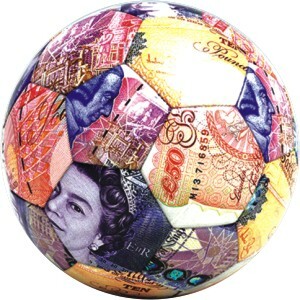 To say football has devalued currencies would be an understatement. Nowadays star players are to small clubs what BMWs are to beggars and that's a huge leap in monetary terms considering that even in 1986, Maradona, one of the greatest players of all time played for little known Napoli. Mega money transfer fees and astonishing wages ensured a boon for the betting industry while some oracular animals' gate crashed into the sport to share the limelight with footballers and bankrupt bookmakers. And why should the balls remain unchanged? Backbreaking research by one company ends up producing one new ball every four years and usually the new ball has to fulfil one condition: it has to be worse than its predecessor. redundant in the future if this trend continues. No wonder Darwin made the right choice!